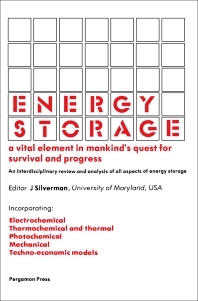 Energy Storage: A Vital Element in Mankind's Quest for Survival and Progress presents the transactions of the First International Assembly held at Dubrovnik, Yugoslavia, 27 May-1 June 1979. It was the first international gathering of industrial, academic, and government experts to discuss all facets of energy storage: electrochemical, thermochemical and thermal, photochemical, and mechanical. In addition to panel sessions and lectures in these four areas, there were assessments using techno-economic models of the impact of various aspects of energy storage. The volume is organized into three sections. Section I consists of the plenary lectures, which are designed to summarize the progress, problems, and future opportunities in various areas of energy storage technology. Section II consists of Summary Proceedings. It was compiled mainly at the conference site and includes summaries of both the papers and discussions at the plenary and panel sessions. Section III contains the papers presented during the panel sessions. "Some Impacts of Energy Storage Technologies on U. S. Energy Problems"
"Fuel Cells and Metal-Air Batteries as Electrochemical Energy Storage Systems"
"Electrochemical Energy Storage on Board of Road Electric Vehicles"
"Lithium Metal Sulfide Batteries for Electric Vehicles"
"Oxygen Electrodes for Electrochemical Energy Storage Systems"
"Electrocatalysis on Surfaces Modified by Foreign Metal Adatoms Its Application in Fuel Cells"
"Ambient Temperature Batteries for Electric Vehicles and Energy Storage"
"Thermal Energy Storage for Non-Fossil Power Plants"
"A Review of Current Aquifer Thermal Energy Storage Projects"
"Large-Scale Annual-Cycle Thermal Energy Storage in Aquifers"
"Thermal Energy Storage for Buildings"
"Sweden - A Case for Long-Term Thermal Storage"
"Thermal Energy Storage Using Metal Hydrides"
"Summary of the U. S. Thermochemical Energy Storage and Transport (TEST) Program"
"Method of Storage and Recovery of Thermal Energy by the Use of the Chemical System: (Ethyl Sulfate)-(Ethylene, Sulfuric Acid) "
"Research on Energy Storage at RisØ National Laboratory"
"Past, Present and Future of Thermochemical Hydrogen Production Research"
"Limitations of Artificial Photochemical Solar Energy Storage"
"Some Recent Progress in Semiconductor-Liquid Junction Solar Cells"
"Processes in Photogalvanic Cells and Their Possibilities in Solar Energy Storage"
"Photoelectrical Cell for Conversion and Storage of Solar Energy Based on Photosensitized Redox Reactions"
"Electron Transfer Processes in Micellar Systems"
"Photoredox Processes. Catalytic Generation of Hydrogen by Reactions of Metal Ions with Water"
"Brief Summary of Canadian Research and Development of Interest to Photochemical Panel of the International Assembly on Energy Storage"
"Compressed Air Energy Storage Technology Program in the United States"
"Actual C.A.E.S. Technology in Europe"
"Demonstration of a Low Cost Flywheel in an Energy Storage System"
"A Flywheel Energy Storage and Conversion System for Photovoltaic Applications"
"Fluid Bed Augmented C.A.E.S. Systems"
"Flywheel Energy Storage Systems Operating on 'Single Active Axis' Magnetic Bearings"
"Methods of Evaluating and Comparing Energy Storage Devices for Automobiles"
"Energy Storage in Automotive Vehicles: An Analytical Model"
"Heating with off-Peak Electricity: A Cost-Effective Way to save Oil and Gas"
"The Assessment of Energy Storage Systems for Electric Utilities"